Do you need heritage sash windows restored in the Brighton area? Are you concerned about planning permission or maintaining the authentic look and feel? We are specialists in the installation and restoration of heritage sash windows in Brighton. We love the challenge of renovating, restoring and repairing sash windows on grade 1 and grade 2 listed buildings. Over the past decade we have brought similes to the faces of hundreds of property owners across Sussex and South Coast of England. We offer a comprehensive range of solutions for your heritage sash windows. This includes full heritage restoration, repair and draught-proofing for heritage timber box sash windows. We are massively experienced in removing, restoring and reinstalling heritage windows. Our process is thorough and careful, and our attention to detail is legendary in the field. You can’t do a full restoration job on heritage windows without taking them out. We understand the process that needs to happen, and have done it hundreds of times before. Your windows are in safe hands with our expert master craftsmen. Weak, damaged or poorly fitted heritage sash windows can be extremely draughty. They can also lead to the loss of a sizeable amount of heat. This can lead to a great deal of discomfort in the colder months, and cold spots around the home. Our heritage draught proofing process will eliminate draughts coming through your heritage windows. At the end of the process, heat loss can be reduced by up to 80%. This leads to a more comfortable, cosy and cost effective building. Need Heritage Window Restoration But Worried About The Impact? 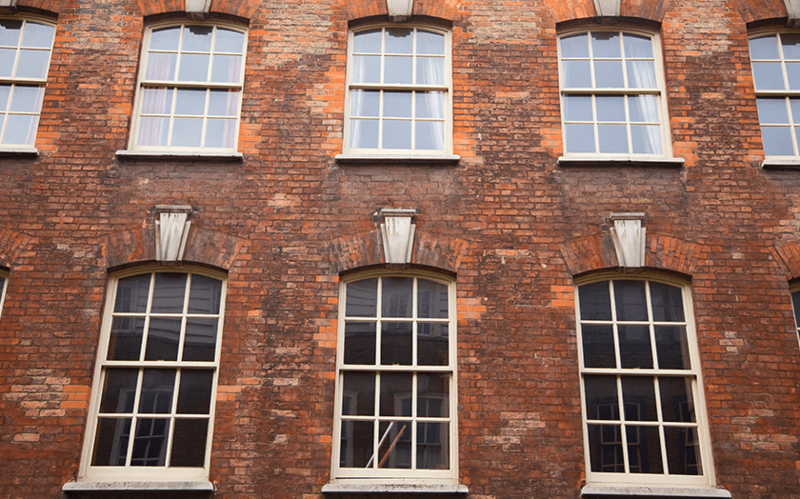 Our heritage sash windows restoration service will get your windows back to their original condition without affecting the integrity or authenticity they bring to your building. We are careful to ensure that we use appropriate materials and techniques to maintain the value in your home and bring about a transformation that is all positive. Our heritage sash windows draught-proofing service is recommended by many local conservation departments, and the English Heritage organisation. This, combined with the plethora of testimonials we have, should convince you that you’re in safe hands when you choose us for your restoration project. With the emergence of innovative new thin double glazing windows we can also maintain the look of your building and double glaze at the same time. Combining modern technology and authentic looks is our speciality. Our services are loved by heritage buildings, commercial clients and residential customers. We do things the right way and that always provides a great deal of confidence to those we work with. If you have a project on the horizon then get in touch today and we can provide you with a free no obligation quote. When it comes to heritage sash windows we are your safe hands.